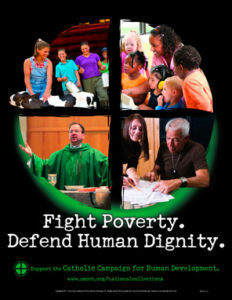 Catholic Charities West Michigan seeks to put faith in action by responding to the call of Catholic social teaching on local, national and global issues. In conjunction with the Diocese of Grand Rapids, we provide advocacy, awareness, and value-added programs to coordinate with parishes and organizations within our West Michigan community. As part of our strengthened mission, Catholic Charities West Michigan produces Faith in Action, a newsletter detailing pertinent social concerns and our call to action as described in our faith. Mission: Catholic Relief Services carries out the commitment of the Bishops of the United States to assist the poor and vulnerable overseas. We are motivated by the Gospel of Jesus Christ to cherish, preserve and uphold the sacredness and dignity of all human life, foster charity and justice, and embody Catholic social and moral teaching. Mission: The mission of Catholic Charities is to provide service to people in need, to advocate for justice in social structures, and to call the entire church and other people of good will to do the same.